After compiling a list of color names that could potentially be used as baby names, the color Cordovan caught my eye. After searching in various baby name databases, I've found that this has never been used as a name in the U.S. 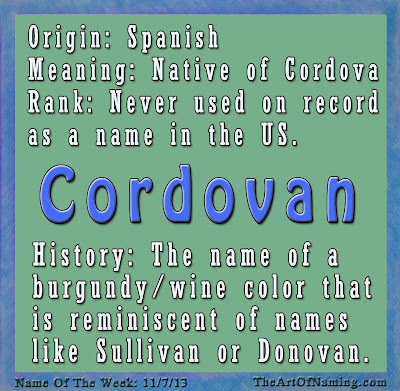 I was struck by Cordovan because of its similarities to names like Sullivan and Donovan and Cor- names like Cordell, Corbeau, Cormac or Corbett. Cordovan sounds like it should be a trendy, modern name. 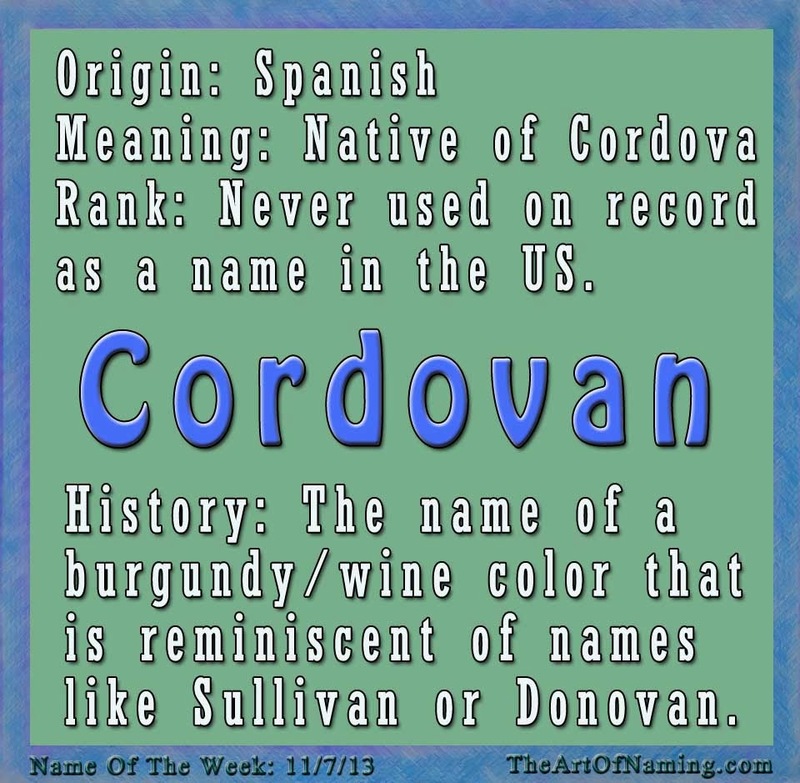 Cordovan is a Spanish name meaning "native of Cordova" which refers to a city in Spain called Cordoba. It was there that seventh century Visigoths began production of "shell cordovan leather." In this case, cordovan describes the color of the leather. It was first used as the name of a color in 1925 in English. As a color, Cordovan is a rich burgundy color, or a dark shade of wine. If you'd like to see what color it is, the Hex number is #893F45. As for popularity, it has never been used on a child in the US since it began keeping record in 1880. I managed to find Cordovan used as a surname in many death indexes and marriage records after a simple search. I also found one woman named Cordovan Denise R. from North Carolina. I wasn't able to track down any birth records in other countries. Since Cordovan has a strong association with leather, it has a masculine image behind it. Cute nicknames could include Cory, Cord, Cordy, Cordo or Van. What would you pair with this fantastic color name? What do you think of it? It's rather handsome, but reminds me too strongly of the shoes - same problem I have with Mary-Jane. View My Articles on Nameberry.com! Disclaimer: The links on this page contain affiliate links and I will receive a small commission if you make a purchase after clicking on my link. 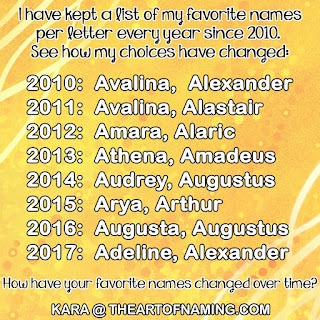 The Best Four-Letter Names For Girls! All Content is Opinion of Kara Cavazos, Owner. Copyrighted by The Art Of Naming. 2017. Simple theme. Powered by Blogger.